The 54th edition of Euroleague is already an unmissable event for European Rink Hockey. It will be the first time that will be qualified four multi-sport clubs. In the latest 23 editions (from 1996-97) it never has happened. In a final four, six or eight, it has happened only eight times with 3 multi-sports clubs: 1999-90 (Benfica, Porto, Barcelona), 2004-05 (Barcelona, Porto, Oliveirense), 2011-12 (F8, Barcelona, Oliveirense, Benfica), 2012-13 (Barcelona, Benfica, Porto), 2013-14 (Porto, Benfica, Barcelona), 2015-16 (Oliveirense, Benfica, Barcelona), 2016-17 (Benfica, Oliveirense, Barcelona), 2017-18 (Barcelona, Porto, Sporting). In this 54th edition, 27 are the Euroleague titles conquered: 22 for Barcelona, 2 for Porto and Benfica, 1 for Sporting. It’s not a record: the most titled final four ever was the 2018 edition in Porto, where the four clubs (Reus, Barcelona, Porto and Sporting) had overall 32 euroleague titles. It’s one of the most titled final four, because only in 3 times the count of titles was greater than the 2019 edition: 2018, 2012 (counted only the four semifinalists) and 2017. For FC Barcelona, the title-holder and 22 times winner, is the 20th times in the Euroleague Top 4 (after 1996), the consecutive eighth time (21st reaching a final edition of the competition). FC Porto is the 14th time that participated, two-in-a-row, and the latest Euroleague title is dated 1990. Sporting is the 2nd time of their history in a F4, where has won one title in 1976. Benfica returns after the latest presence in 2017 and the latest title is dated 2016: 8 the partecipation in a Top4 from 1996 (9 if you considered the F8 of 2011-2012). 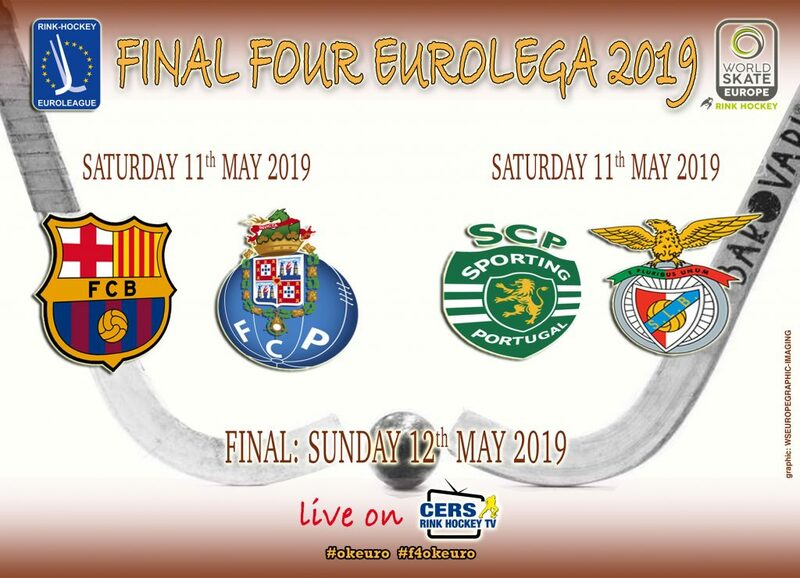 It will be a pleasure watching it through our WebTV, www.cers-rinkhockey.tv, all over the world, but for knowing the host city of the final four, it will be necessary to wait until the 18th of April, when will be communicated officially where it will be played.